The Bowls Green was first established in 1990 and it soon became apparent that in dry spells it needed substantial efforts to keep it watered. In the early days we used a miniature water tractor that used the mains water pressure to drive it forwards – very slowly – whilst the rotary spray on the top watered a moving a strip of the green. This had to be moved onto the next strip a couple of hours later after it had traversed the green, which was all very tedious. 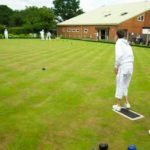 Around 1995, the Bowls Club raised the funds to install an automatic watering system drawing from a 5,000 litre surface mounted tank that still drew its water from the mains. When the extension was made to the Squash Court in 1993 to at least provide a couple of toilets on site, a 5,000 litre underground septic tank was installed at the back of the site (now located under the football store). It was anticipated that this could be used for the main clubhouse building when it was built in 1998. However when the clubhouse building started it was discovered that the septic tank had been set too low (below the average water table) so it could not be used for its intended purpose and another larger Septic tank was located further back (now under the rear car park). This original septic tank was then repurposed as a rainwater harvesting tank being filled from the gutters on the main clubhouse roof. One of the Bowls members, Roy Lines, then designed and built an electro-mechanical control system to manage the topping up of the surface tank already in place by using rainwater from the old septic tank, and so limit the use of mains water. However in dry spells the bowls green needed watering nearly every day to keep it in top condition and this soon depleted the supply of stored water, so we would have to revert to mains water quite quickly. In 2003 SiD raised further funds and installed 2 purpose designed 6,500 litre underground water tanks also fed by the gutters from the roof of the clubhouse. This helped to provide a total of 18,000 litres of underground water storage, which meant we could water the green for around 10 days in a dry spell, before having to revert to mains supplies. At the same time the old control system was replaced with a more modern electronic system that proved more reliable in the end! With recently replaced spray heads on the automatic watering system, this system remains in service today, making a significant reduction in our need to use mains water for watering during dry spells.